If you’re looking for the performance SUV that started it all, the SQ5 should be your top choice. It’s not a Mercedes, it’s no Porsche, and that’s ok with us. We like the unique blend of comfort and athleticism that only an Audi can provide. 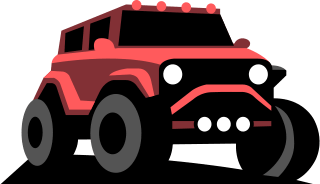 It may not be our top pick of the souped up sports SUVs, but that doesn’t mean it is not a solid choice for some. The GLC 43 AMG is a bit quicker, the Porsche Macan S handles the twisties with a bit more poise; but we guarantee the SQ5 will still provide plenty of smiles per miles! Priced at upwards of half a hundred grand, the SQ5 isn’t exactly the SUV steal of the century. That said, it’s tough to quantify the value added by the refinement of an exceptional SUV like the Audi SQ5. It doesn’t do much better than its competitors but it has some special qualities that make it unique. It may just be the classiest of the sporty compact luxury SUVs. It doesn’t have the “look at me” presence of the souped up Benz and Porsche Macan S. It has the subtle, simple styling that has led the way for Audi’s resurgence in the US market. It has the quality interior we have come to expect from the four rings. It has the sedan-like handling that sets the brand apart in the segment. For all those things, it may be considered a value for the money. The Audi SQ5 Premium Plus starts at $53,300 while the SQ5 Prestige starts at $60,800. The Technology Package costs $4,150 for Premium Plus models and is included in the Prestige model at no additional cost. The price point puts the the SQ5 firmly in the crosshairs of the Porsche Macan S, Mercedes GLC 43 AMG, and the Jaguar F-type S.
The SQ5 revolutionized the SUV market in 2014 by offering the first SUV that competes with performance oriented luxury sedan. Since Audi essentially wrote the book, we expect a capable, composed, athletic driving experience. The SQ5 does not disappoint! The fabled Quattro all wheel drive system receives a special tune for this model that allows up to 100% of the power to be applied to a single rear wheel when necessary. During spirited driving, the system skews toward the rear wheels, unlike the standard Q5 model. The SQ5 is motivated by a tuned up version of the 3.0L supercharged V6 found in the 3.0T Q5. This one makes a staggering 354 horsepower and 346 lb-ft of torque. The jaunt from 0-60 mph is made in just 5 seconds flat, faster than the Porsche Macan S. 5.1 seconds if you ask the manufacturer, we think VW may have inflated the figure slightly so they didn’t galvanize Porsche Macan sales. The ZF eight speed gearbox is flawless and shifts intelligently, though we prefer using the paddle shifters for aggressive downshifts. We can’t help it, we like the way the pipes sing. The suspension is much stiffer than the already stiff Q5 model, making the SQ5 even more agile than the Q5, a feat we thought was impossible. As a result, the ride is a little bumpier, but we assume this doesn’t bother you if you’re in the market for an SUV with sports sedan performance. Grip is abundant from the 20in wheels clothed with performance summer tires. Body roll is nearly nonexistent, which is no small feat for an SUV. The optional Audi Drive Select system allows the driver to further tweak settings like suspension stiffness, throttle response, and steering sensitivity. When compared with some of the competition, steering feel may not be quite as good as some of the others. Fuel economy is not great for an SUV of this size at 17 mpg city and 24 mpg hwy. However, no one buys a 5 second SUV to drive it efficiently, so it’s probably not a concern. If you read our Q5 review, you’re already aware of how much we love the Q5 interior. The front seats are highly adjustable and supportive, with plenty of bolster for sore backs. The SQ5 adds some tasteful modifications that accentuate the sporty edge of the S model like an amazing flat bottomed steering wheel, aluminum pedals, and some soft, simulated suede seat inserts. Contrast stitching really makes the interior “pop” when compared to the standard Q5. The steering wheel also features brushed aluminum paddle shifters that increase the fun factor of pushing the SQ5 to its redline. The dash features the silver faced gauges found in all S line model Audis. The stock MMI infotainment system isn’t great and expect to pay a premium for the technology package for “must haves” like bluetooth connectivity and a rearview camera. There are no USB ports available at any trim level which is dumbfounding in 2017. With the SQ5’s heart pumping performance, maybe it is better that you aren’t fiddling with your iphone. The second row is spacious and comfortable enough for two adults, with seats that recline and slide to find an optimal position. This is a feature that isn’t available in most of the competition, so keep that in mind if you regularly haul passengers. Cargo capacity is spacious at 29.1 cubic feet and 57.3 cubic ft with rear seats folded down. Besides distinctive badges, quad exhaust tips, and a few slight body trim modifications, the SQ5 is virtually identical to the Q5. This is not a bad thing as we believe the Q5 is a beautiful ride. However, if you’re looking for an exterior that reflects performance capability, the SQ5 is quite understated. For example, the GLC 43 AMG is much more distinct from the GLC 300 than the SQ5 is from the Q5. Some consumers will appreciate the relative stealth, while others prefer the appearance to reflect the considerable sum shelled out for the premium performance. We like the understated design, if ostentation is a priority, the Porsche Macan S can be had at a similar price. The lines flow well from the front to rear, which we especially like. 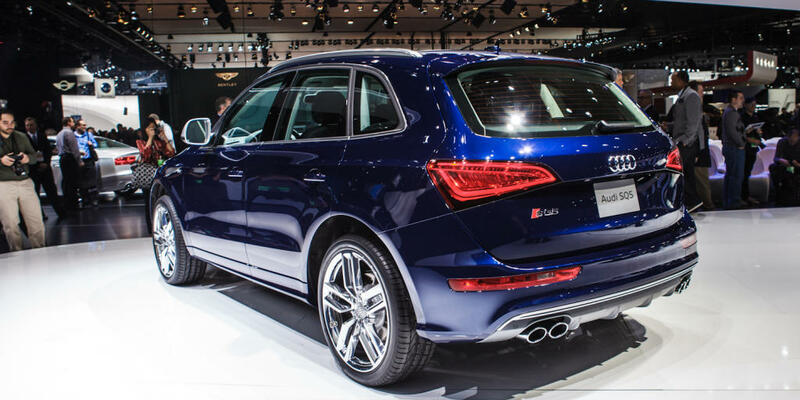 From the back, the SQ5’s quad exhaust and slightly wider body work give an accurate impression of its athletic nature. Side skirts complete the picture, making the SQ5 appear lower and wider. Of course, the SQ5 also dons Audi’s distinguishing LED lights that round out the impeccable design. Like the Q5, we think the SQ5 is one of the best looking compact luxury SUVs. There are three potent performance SUVs that can be had for a similar price to the SQ5. Disclaimer: to be completely competitive with price to the SQ5, all would be bare base models except the “Sport Chrono,” launch control equipped Macan S. That feature alone shaves two tenths of a second off the Macan S’s 0-60 time to perform evenly with the SQ5 at 5 seconds. While ticking boxes can easily bring the total price of a Macan S well over $70,000, a base model with only the Sport Chrono package totals at just $58,460. For the money, it has the same straight line performance but handles much better, like a Porsche. It also receives higher reliability and buyer satisfaction ratings, among a multitude of awards. Plus it’s a Porsche, need we say more? The Jaguar F-Pace S AWD with no boxes ticked can be delivered to your local dealer for $60,770. The Jag packs more horses and more space than the SQ5, making it a practical choice if you need more room than the Audi provides. It is a tad slower to sixty and corners with considerably more heft. We would prefer the SQ5 for performance driving. Finally, the GLC 43 AMG, with no options, will be dispatched to your dealer for $55,895. That’s just $2,500 more than the base SQ5! Sorry Audi, but we must say it is worth every penny. When Mercedes says “the best or nothing,” they mean it. The GLC 43 looks and feels special, befitting of the AMG badge. The twin turbocharged, dual overhead cam, 24 valve 3 liter V6 cranks a whopping 362 horsepower @ 5500rpm and 384 lb-ft of torque @ 2000rpm. The engine screams, cracks, and pops its way to 60mph in just 4.7 seconds. While the Audi’s interior is one of our favorites, the Benz’s is downright opulent. It is strikingly similar to the C class interior, which won Car and Driver’s award for best interior under $60,000. There is a reason, words can’t describe the feeling one gets sitting in the cockpit of this beautiful Benz. Sure, it’s over the top and gaudy, but so what! If we spend 60k on an SUV, we want people to know it. With the aggressive AMG body kit, badges, and raucous pipes, few people won’t! If a less loud, classier SUV fits your carefully crafted, professional image, make the practical choice and buy the Audi. For the money, we’ll have the AMG, but our tastes are not nearly as refined as our readers’. The usual suspects, JD Power and Consumer Reports, have not offered a predicted reliability rating on the SQ5. Considering it is a premium branded, German SUV, we can extrapolate the data and tell you it’s probably pretty average in the reliability department. Given it’s the S model, it will probably be driven hard and cost a little more to maintain than average. Expect expensive parts and overpriced labor rates, the German SOP (Standard Operating Procedure). The Audi SQ5 received a 4 out of 5 star overall rating from the National Highway Traffic Safety Administration. Side impact was a full 5 stars, while front impact and rollover ratings were 4 stars. From the Insurance Institute for Highway Safety, the SQ5 received the highest possible scores. The SQ5 includes front passenger dual stage airbags, side curtain airbags, knee airbags, and side thoracic cavity airbags standard. Rear side airbags are available as an option. The SQ5 lags behind the competition in driver assistance technology. Rearview camera, parking sensors, and blind spot detection are only available with the Technology Package. Arguably the most important safety feature, the oversized brakes are superb in the SQ5 and bring the 4,442 pound Audi from 60-0 in just over 100 feet. For example, the Audi R8 stops in 101 feet, which puts the SQ5 brakes on par with those found in supercars. If you need computers to do your braking for you, there’s always the Benz. Otherwise, we think the SQ5 is safe choice.